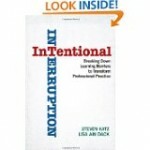 This year, our school board has begun to adopt the philosophy behind Dr. Steven Katz’s book, Intentional Interruption and to that end many of our administrators are providing their staff with the opportunity to determine the path for their professional learning. As there is value in collaborating beyond your own school walls, there is an expectation that teachers will embrace the chance to work with colleagues in other schools. Last week I was thrilled to be invited to one such session where the primary division from four schools came together to share identified student needs, in an effort to develop a common teacher need which would form the basis for their collaborative inquiries. Asking caring educators what their students struggle with quickly created a common thread of connectedness among the participants. Most teachers could articulate an evidence-based list of student needs. It was only after some pointed questions that the groups were able to condense their long list into 4-5 common themes. 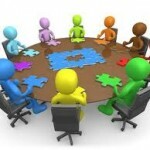 Yet, even after the themes were shared and teachers positioned themselves to create “like-minded” groups, much conversation still needed to occur, which reinforced the need for a common understanding of the student need, before moving to the next step. 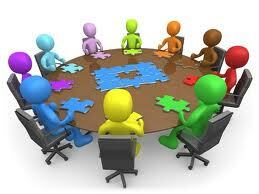 Those conversations are crucial for the success of the collaborative inquiry process. Once the group had a common understanding of what the student need was and what their current scenarios looked like, came the challenging part of asking the questions which would support teachers in reflecting on their current practice. Asking anyone to reflect and then to consider changing/enhancing/refining one’s practice takes skill and the ability to ensure you are honouring what the teacher is already doing. The questions also need to focus on the evidence of student learning. We know that teachers are working very hard to “teach”, but what is the evidence that the students are learning? As our afternoon continued, I watched as the administrators and instructional coaches flowed from table to table redirecting conversations, digging deeper with their questions and then coming together to confer on what they were seeing and hearing from their staff. The one common comment was that this work is “messy’. There is no pre-made instruction manual or fool-proof recipe to follow. Nor would we want one because the reality is that the sustainable learning comes from everyone (all educators) being engaged in the process. For the administrators to arrive with a well-crafted Inquiry question ready to share, the teachers would have lost out on the opportunity to be a part of the process and hence, not as personally or professionally invested. It was amazing how quickly the afternoon flew by. For me, as a visitor to the process, I quickly found myself invested in children that I’d never met. I was getting excited that their teachers were starting to formulate ways of refining their practice which would ultimately have an impact on how students demonstrated their learning. And although not all changes to practice may have the intended outcomes, the fact that these teachers are willing to try something new, something based on what research supports as good pedagogy is the first step in a professional learning cycle. I commend the administrators for looking for ways to incorporate a networking component into the reflective procedure of determining one’s problem of practice. And although step one was messy, I have no doubt that the end result will be meaningful for all parties involved (teachers, students and administrators). How are you, as administrators, honouring the work of your staff and providing them with the conditions which will allow them to delve deep into a problem of practice?